Being a blogger can have some really neat perks! 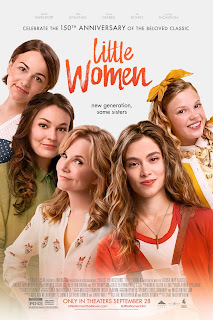 I recently had the opportunity to preview the new Little Women movie. I honestly wasn't sure what to expect from this movie. I have read the book but that was at least thirty-five years ago so I'm not a purist with that. I don't remember much about the book except I cried and their were sisters. Then there was the Winona Ryder movie adaptation which I also watched but remember vaguely. Why am I telling you this? So you understand where my review comes from. I knew the basic story - a group of sisters with their Momma. Sisters who faced hardships and had amazing bonds. What my review isn't is a huge fan of the original book (or movie) who can critic each aspect and how this version handled plot twist with the fresh new version. I don't want anyone in that category to be disappointed with my thoughts because I loved this movie. and while it features the March Family I think it stands on its own. So pretty much from the beginning we are going back and forth from the past to the present. The movie definitely sets the stage for each sister's personalities. Jo was wild, free and a bit overwhelming. (I can't imagine having a sister like her!) By the end of the film you will fall in love with her, I did. I think maybe she is this way - her character being so over the top - because Beth by nature is so meek. As the movie progressed I found myself loving it and Jo more and more. I loved the young March sisters and how they lived in such a sweet, magical world. Guess what they were homeschooled which I LOVED! I don't mind the March girls being the face of homeschooling - as you could tell they were all imaginative, creative and talented!! Laurie was fantastic - everyone should have a Laurie in their lives. Have plenty of tissues available when you watch, I cried a few times! Lea Thompson was wonderful on screen - I love that they cast her! This movie was very enjoyable. Now, there is one thing I would like to note in case you are going to see this with your children. I know many of my readers are conservative and I would like to note that their is some alcohol in this movie. There are at least three scenes with drinking present. I just felt I should mention it because while this is very much a family friendly movie I was surprised by the drinking. That is really the only thing that jumps out to me as far as what people might be concerned about. A heartwarming tale of sisters who love each other - a perfect choice for girl's night!